Starting from the pessimistic view of 'more means worse', Phil Race (University of Glamorgan) explores ways that the challenge of more students can be turned to all our advantages. Is There More to Group Work than Meets the Academic Eye? Jo Malseed (Lancaster University) shares her experiences of a new group-based student- centred course in Independent Studies at her institution. Why is Planning So Boring? Bob Jarvis (South Bank University) argues that achieving professional competence should not mean a dull diet of slavish imitation of current professional practice. Clara Greed (University of the West of England) asks if the answer to why so few women are employed in the construction industry lies in the way surveyors are educated. The Europeanisation of Planning Education: a lost opportunity? How should the curriculum of UK planning schools respond to what is happening in Europe? contemplates Glen McDougall (Oxford Brookes University). Vicky Schofield (University of Central England) looks at the arrangements in her institution. 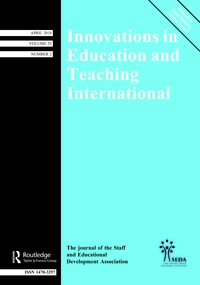 Douglas Edgar (Glasgow Caledonian University) outlines the characteristics of the delivery of educational development at five former English polytechnics and attempts to identify some general principles for successful educational development. Brian Mitchell (University of Wolverhampton) describes the use of group work in a level one business law module, the delivery of which was influenced by the Enterprise in Higher Education Initiative.